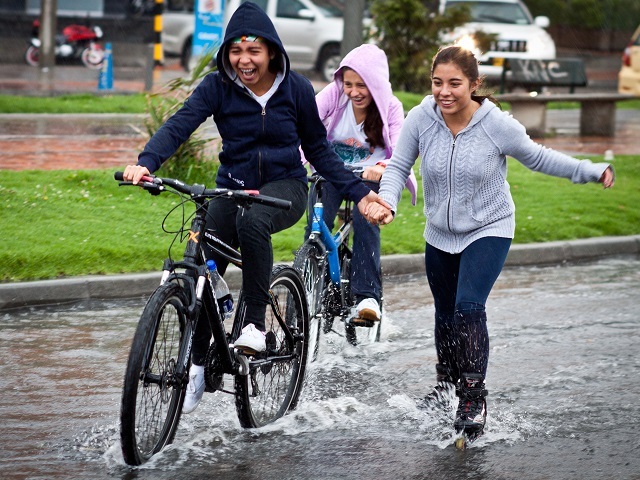 Young residents of Bogotá, Colombia, enjoy a rainy Ciclovía. Today, Dario Hidalgo – a Colombian native – shares his memories of Ciclovía as a child and recent experience at Raahgiri Day in Gurgaon, India. Photo by Claudio Olivares Medina/Flickr. Darío Hidalgo is EMBARQ’s Director for Research and Practice, a transport expert, and Colombian native who grew up participating in Ciclovía in Bogotá. Today, Hidalgo shares his memories of Ciclovía and recent experience at Raahgiri Day in Gurgaon, India. Certain moments make me very emotional – when a fellow Colombian wins a medal in the Olympics (eight people in London 2012), or a Colombian cyclist crosses the line first in a stage of the Tour de France (Nairo Quintana this past summer), or when my football team, Millonarios of Bogotá, wins the Championship (last December). I felt a similar sense of happiness a few weeks ago when I experienced Raahgiri Day in Gurgaon, India. That’s because the concept of closing streets to cars and opening them for people has been a part of my existence, at least through Bogotá’s version known as Ciclovía, for the past 37 years. Biking at Raahgiri Day immediately became the highlight of all of my 21 trips to India since 2006. I hope that it will follow in the footsteps of Ciclovía to become a successful, non-motorized community event and the seed for sustainable mobility interventions, not just in the national capital region, but throughout India. I was a kid when I attended Bogotá’s Ciclovía for the first time. Since then, I have continued to attend on several Sundays and holidays. I now take my children Juan Pablo and Laura there as part of our weekend routine, just like thousands of families in Gurgaon now attend Raahgiri Day. The “crazy” idea of closing streets to vehicles and opening them up for pedestrians in Bogotá was the brainchild of a group of activists led by Mr. Jaime Ortiz. In 1976, they were able to convince Mayor Augusto Ramirez-Ocampo to close three kilometers (1.86 miles) of an arterial road on Sundays. The idea stuck; eventually the city’s sports and recreation department created a Ciclovía office to coordinate with the police, other city agencies, and volunteers. The current Ciclovía path is 120 kilometers (74.56 miles) long and takes place every Sunday and public holiday – 70 days a year – from 7:00 am to 2:00 pm. Nearly two million people participate in each event, and Ciclovía includes recreational activities, such as aerobics, tai chi, capoeira and yoga classes, and extreme biking and skating exhibitions. Several athletic competitions and biking rallies also share the space throughout the year. Since 2000, Bogotá has celebrated one Ciclovía at night to launch Christmas celebrations, and bans all cars from 6:00 am to 7:00 pm on the first Thursday in February. Ciclovía was the first event of its kind to prove that many people liked to bike, and facilitated the implementation of permanent bike lanes – which have grown from an initial five kilometer (3.1 mile) loop to 313 kilometers (194.49 miles) across 30 corridors in Bogotá. And Ciclovía enjoys popular public support – when a Colombian Congressman proposed a law banning Ciclovía in 2007, urban residents protested and it was defeated. This can happen also in Gurgaon. The great popularity of the event may also help raise awareness about the need for permanent, protected bike lanes and pedestrian infrastructure. Initiatives like Ciclovía and Raahgiri Day are heavily supported by organizations like the World Health Organization (WHO) because they’re viewed as important ways to reduce the risk of obesity. WHO even launched “1000 cities – 1000 lives” as the theme of World Health Day in 2010, which focused on the link between urbanization and health. The campaign has helped promote the idea in cities around the world that closing streets to traffic and promoting physical and mental health activities can be extremely beneficial for the health and quality of life of urban residents. Dr. Enrique Jacoby, member of the Pan American Health Organization (PAHO), has also been a strong advocate of Ciclovía, and created a similar program in Peru with the potential to benefit 400 municipalities during his tenure as Deputy Minister of Health of Peru. Furthermore, academic articles in medical journals have revealed the positive health impacts of Ciclovía programs in Bogotá, Medellín, Cali, and San Francisco, Colombia proving that they are cost effective from a public health perspective. With the lack of physical activity currently responsible for 3.2 million premature deaths every year and becoming a 21st century epidemic, the benefits of non-motorized transport are important to capitalize on. The success of Ciclovía and documented public health benefits associated with non-motorized transport are compelling enough to make Raahgiri Day a permanent feature in Gurgaon, and expand its current five kilometer (3.1 mile) route. More importantly, the happiness, sense of belonging, and joy I saw reflected in over 10,000 faces in Gurgaon were priceless. My hope is that this initiative will spark an interest in permanent bike lanes and improved pedestrian facilities in India, which are necessary prerequisites to making transport safer, more accessible, and greener. To learn more about Raahgiri Day, read our previous blog posts on TheCityFix about the launch of Raahgiri Day and a re-cap of the first event.